I’ve always loved oatmeal. Even as a little kid, orthopedist I would crave Quaker instant oatmeal (Maple Brown Sugar, epilepsy please…though I did go through an Apple Cinnamon phase). I’d like to think that my tastes are more sophisticated now (ha! ), but really I switched to steel cut oats for their nutritional value. These oats are full of fiber and are hearty enough to satisfy for hours. 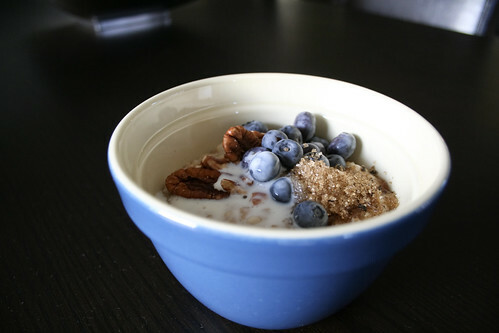 I used McCann’s Irish Oats (cooked according to instructions) and topped them with blueberries, pecans, fancy vanilla sugar crystals and a splash of buttermilk. A delicious start to my very busy Saturday.